An Android tablet is a complex piece of electronics, delightful, inspirational, intimidating. Obviously that qualifies it as the next great thing. It also means that if you want to get the most from the device, you need some gentle hand-holding and careful explanation. 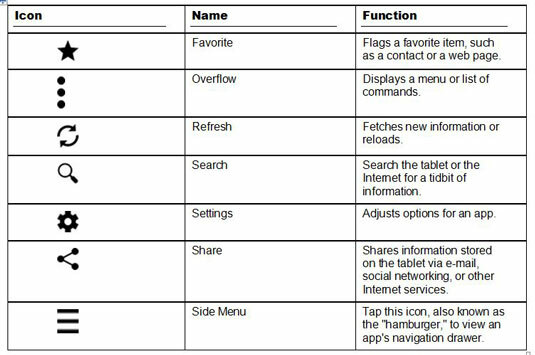 This Cheat Sheet provides that information, plus plenty of tips and tricks, and other useful information that help make your Android tablet experience a pleasant and productive one. The main screen on an Android tablet is called the Home screen. 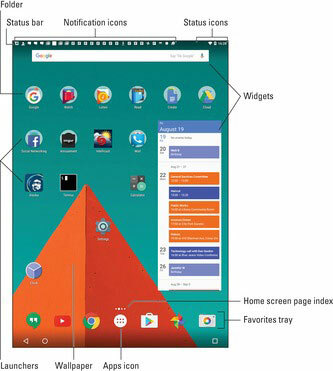 You’ll find several Home screen pages, some marching off to the left and others marching to the right, for a total of anywhere up to seven Home screen pages, depending on the tablet. Each Home screen page can be adorned with icons, widgets, and sneeze globs. Only the sneeze globs are easily removed by using a microfiber cloth. 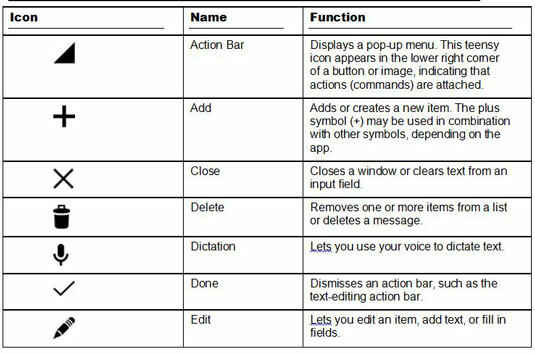 Android tablets feature common icons for using the Home screen as well as various apps. These are the navigation icons, and they are often found at the bottom of the touchscreen. also be referred to as a touch or a press. moves items on the screen. to reduce the size of an image or see more of a map. Dictation! You can speak into the tablet as an effective and quick alternative to using the onscreen keyboard. Quickly switch between two or more programs by using the Recent icon found at the bottom of the Home screen. Remember that you can add icons and widgets to the Home screen pages. An Android tablet can make phone calls, but you must first install the proper app. For traditional phone calls, Skype is a good idea. The Google Hangouts app can be used for phone calls, as long as the Hangouts Dialer app is installed. Use the various Search icons to look for things on the tablet, on the Internet, or in a specific app. When downloading updates or new apps, or for faster web browsing, activate the tablet’s Wi-Fi. Use Google Now to control the tablet with your voice or to search the Internet. If you ever happen to find yourself in really serious phone trouble, here is a smattering of trusted places to check out for help with your Android tablet.